Very sleek and refined, but with loads in reserve, this shows layers of mocha, espresso, bittersweet coffee, mineral and currant paste all framed by dense but supper supple tannins. Beautifully rendered, and the best vintage yet for this winery's flagship wine. Best from 2009 through 2015. 4,500 cases made. Who said Chile doesn't make cellar-worthy reds? 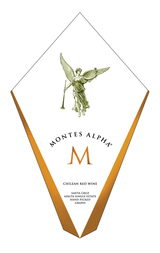 This vintage of Montes Alpha M is well-oaked, strapped and structured. Early attackers will find coconut, mocha and chocolate running the show, but if you hold the wine for another two to five years, it will likely settle, balance out and become an excellent model for what is high-end Chilean Cabernet Sauvignon (with 20% other Bordeaux grapes).